Can't make it to the beach this summer ... or just want to relive that Hawaii vacation over and over again? (I know I do.) Well, Bobbi Brown Beach Shower Gel is fabulous for either sentiment. The name of this shower gel really is apt -- it smells exactly like the beach. I have to admit I was curious before I popped open the tube. How could the delightful smell of the beach (minus seaweed, which looks and smells disgusting) be poured into a fragrance? 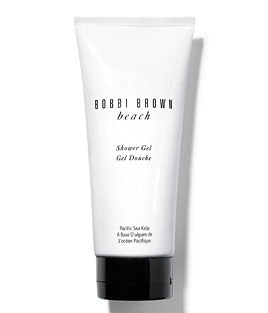 But Bobbi captures it perfectly with notes of sand jasmine, sea spray and mandarin. The scent is somehow intoxicating, refreshing and purely delightful all at once. And luckily, it won't follow you all day -- it's light and crisp without any cloying feeling left behind. And the lather! I haven't seen lather this good in I don't know how long. Only a dime-sized amount upon your washcloth or pouf will get you so many bubbles, you'll be hard-pressed to get them all onto your body. Plus, it's formulated with sea kelp extract to moisturize and condition as it cleanses. The packaging is simple -- just a white tube with black writing and a black cap. But there's something quite nice about the simplicity of it, I must admit. It's clean, refreshing and doesn't put on any airs -- just like the beach.